Bomber Command attracted, and got, the best men of a generation. They were (in general) more highly educated than many of their time, they were carefully selected and they were highly trained. Many achieved great things during their time with the Air Force. A significant proportion – those who didn’t come back – never got the chance to follow that achievement up with similar success in post-war life. For some who did survive, their few short months on an operational squadron would come to define the rest of their lives. But there were also others who went to war, flew a tour of operations, returned to Australia – and, putting all thoughts of the war behind them, simply got on with life. One of those was Pat Kerrins, who died on Easter Sunday. Pat was a Lancaster pilot. He grew up on a farm just outside the northern Victorian town of Tatura and, after leaving home, worked for the Postmaster General’s department in Melbourne and Sale. It was while he was at Sale that war broke out and, perhaps having caught the flying bug from the close proximity to the RAAF base nearby, as soon as he was old enough he joined up, first as a transport driver but eventually as a trainee pilot. Pat trained in Australia and was selected as a fighter pilot. He travelled via the US to England, but on arrival found a long wait to get onto a fighter squadron. Bomber pilots, on the other hand, were needed immediately – so he swapped over, and would eventually fly 32 operations with 115 Squadron. He ended the war as a Flying Officer. ’26 June 1942,’ he rattled off in a flash. Somehow I didn’t think his memory would present too much of a problem. I think it was Pat’s favourite self-deprecating joke; he asked me the same thing the day that I visited him! But talking about his wartime experiences was only a fairly recent development. After the war, Pat never flew an aeroplane again. He returned to Tatura and settled down on the family farm. He raised a family (eventually becoming a grandfather and then a ‘2-Pa’), played an important role in the developing Tatura dairy industry and was generally involved in the life of the town, volunteering with groups like Legacy, the local AFL club and horseracing club. He was awarded the Order of Australia Medal in 2001 for his services to the local community. Pat was such a legend in and around Tatura that about one thousand people attended his funeral there last week, and a large crowd of those who couldn’t fit inside the church spilled over into the driveway outside. He had been baptised and married in the same church. I spotted perhaps my most favourite tribute to a real character of the local area as I was driving out of Tatura after the funeral on Saturday. Pat had a lifelong love of horses and was heavily involved in the Tatura horseracing club, officiating as a steward for many years at race meetings. I happened to glance to my left as I was passing the racecourse, just in time to flash past a sign proudly proclaiming the name of a large expanse of dirt. It was, the sign said, the Pat Kerrins Carpark. I only knew Pat because he was a Bomber Command veteran. But while his two or three years in the Air Force were an important part of his life, they did not come to define it, and arguably his greatest successes came after he returned to Australia. His impish grin and cheeky sense of humour will be much missed. Pat was my fathers first cousin. Your article is first class. You have got him in one! Thanks for your kind words. I didn’t actually know Pat for very long, but somehow he made it feel like I did… I’m sure all who knew him got the same feeling. Got it thanks Mary, reply on its way! Thank you Paul, change made. I am the eldest daughter of Pats mid upper gunner “Roy Clark”. Thanks to Pats flying skills , my sister and I are here today, and now all the family are Aussies, just so happens our first Grandson is named Patrick. Great to hear from you. Pat always said the best thing of his wartime service was that he got to work with such a fantastic crew. 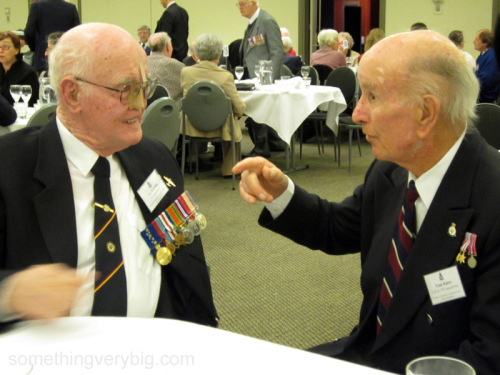 I always find it amazing how the bond between Bomber Command crew members is often carried down through their families as well. A wonderful tribute to Uncle Pat. My father Peter Kerrins is the only surviving member of the family now …being the youngest of 10 – the funeral reminded us all of the wonderful legacy Uncle Pat has left and how proud we should all be to bear the Kerrins name. Here’s to you and here’s to me, may we never disagree, if we do, bugger you, here’s to me! Pat Kerrins toast. Much to thank this wonderful man for. His skills as a pilot brought my Dad home safe and sound. Gone but never forgotten. I reckon that toast just about sums up Pat’s character, Gill, thanks for sharing it. My uncle was called Bill Oliver, and he was the navigator for Pat Kerrins for about 25 ops towards the end of the war. He must therefore have known Roy Clark as well. My father still has his log book. According to my father, he spoke very highly of Pat Kerrins. He became a schoolteacher after the war but never married. Unfortunately he died in 1986 at the age of 63. We have a photo of him in his flying suit, which I believe was taken whilst training in Canada. He never spoke about his experiences to me or my brothers of course! G’day Bill, and lovely to hear from you. It’s always great to hear that families of veterans keep, and appreciate, the little relics like the photograph you have of your uncle, and then have enough interest and curiosity to get onto the Great Google Machine to try and find out something about them. It’s the best way to make sure the stories live on!